There is no sound more grating than a fire alarm. During an emergency, however, that same sound becomes a lifesaver – a blaring, ear-splitting lifesaver. 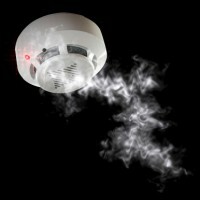 Not only do professionally installed and maintained fire alarms save lives and protect property, they are required by law in many situations. NFPA 72 requires that systems be monitored by central, automated stations. Here’s a look at how they work. Staples, drills, and other equipment. To further minimize the impact on the customer, they will fish in the system and finish as they go. In other words, they’ll drill small holes into the walls, pull the wire through, trim out the device, and clean up. And that’s it. You shouldn’t see them again until they come back for the final test, when the fire marshal signs off on the system. A centrally monitored fire alarm system helps building owners and property managers comply with the law, protect their properties and the tenants inside them. While customers hope they never need their fire alarm system, it’s reassuring to know they are in place, and quietly working in the background.